Chrichton's World: Review Hail, Caesar! (2016): Massive letdown, Mel Brooks would have done it much better! 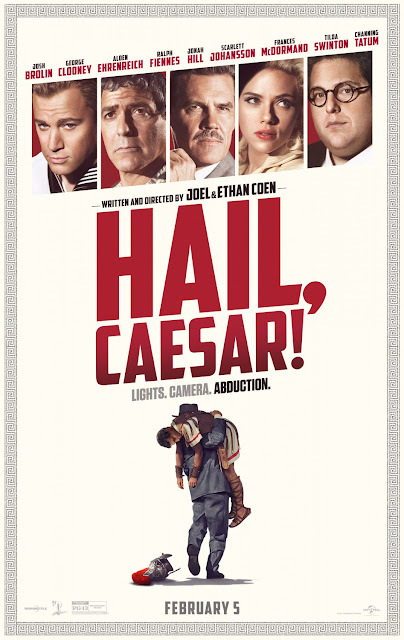 Review Hail, Caesar! (2016): Massive letdown, Mel Brooks would have done it much better! Overjoyed was I when I saw the trailer. Hail, Caesar! looked like it was going to be a brilliant parody on Hollywood. Sadly I have to report that this film is quite the opposite. Hail, Caesar had everything to become this decade´s The Producers (1967). But instead of focusing on movie making alone the Coen Brothers make the mistake to take it broader resulting into an incoherent and downright messy film that utterly fails to make you laugh. And it is not the fault of the actors. They really try their hardest to bring their A game. Unfortunately they are let down by their directors who seem to have let their arrogance get in the way of good film making. What were they thinking? And please don´t fall for the usual excuse that if you did not like it you probably did not understand. I understood perfectly. But that does not mean I can´ be critical about it. Thing is this film is not nearly as clever as it pretends to be. I was very aware of what they were trying to do. Except they missed the sharpness and intelligence directors like Mel Brooks or Woody Allen manage to put into their work. Hail, Caesar! is more like a sketch show tied together by main character Eddie Mannix played by Josh Brolin who plays it far too straight. I am supposed to care about him and what he has to deal with except I never could bring up sympathy for him. Clooney achieves this very easily by his sustained goofiness. All the other characters barely matter as they are only there to illustrate Hollywood madness. Alden Ehrenreich impresses but apparently he was not allowed to shine. Ralph Fiennes is severely underused and completely wasted. In a special I saw that all the actors involved were enthusiastic about the film but I have a suspicion that they are faking it. From what I have seen all of the actors involved were limited by poor direction and that must have been incredibly frustrating. The viewing experience is equally frustrating since it is obvious what they were aiming for but somehow failed to deliver what was needed. I blame pretension and ignorance. Just observe the bit about communism and you know what I mean. I had high hopes and expectations for this film. There are only one or two scenes that were truly funny. Everything else is just a waste of your time. I hate to say it but please stay clear from this trash.